We would like to invite you to submit entries for the upcoming juried exhibition: “THE 2014 FL3TCH3R EXHIBIT- Socially and Politically Engaged Art” from October 15 to December 3, 2014. “THE 2014 FL3TCH3R EXHIBIT” is a multi-national juried exhibition in memory of artist Fletcher H. Dyer. Awards greater than $500 will be granted. Reece Museum located on the campus of East Tennessee State University, Johnson City, TN will host the exhibit. Work submitted should address current social and political issues. Diverse media and approach to the theme are encouraged. A non-refundable entry fee of $30 is required for 3 entries/art works. Additional works may be submitted for $7 each. Our Juror is Elliott Earls, Artist-in-Residence and head of the Graduate Graphic Design Department at Cranbrook Academy of Art. Earls work as a designer, performer and artist is represented in major collections. Fletcher H. Dyer, age 22, was lost too soon in a motorcycle accident in Johnson City, TN on 11/5/2009. Fletcher was a senior in Art and Design at East TN State University concentrating in Graphic Design under a Bachelor of Fine Arts program. As an artist and designer Fletcher created works that addressed social and political issues through visual means. THE FL3TCH3R EXHIBIT aspires to honor Fletcher H. Dyer’s legacy by providing a venue for artists to exhibit artworks that continue the dialogue. The exhibit's proceeds after expenses will fund the Fletcher H. Dyer Memorial Scholarship. 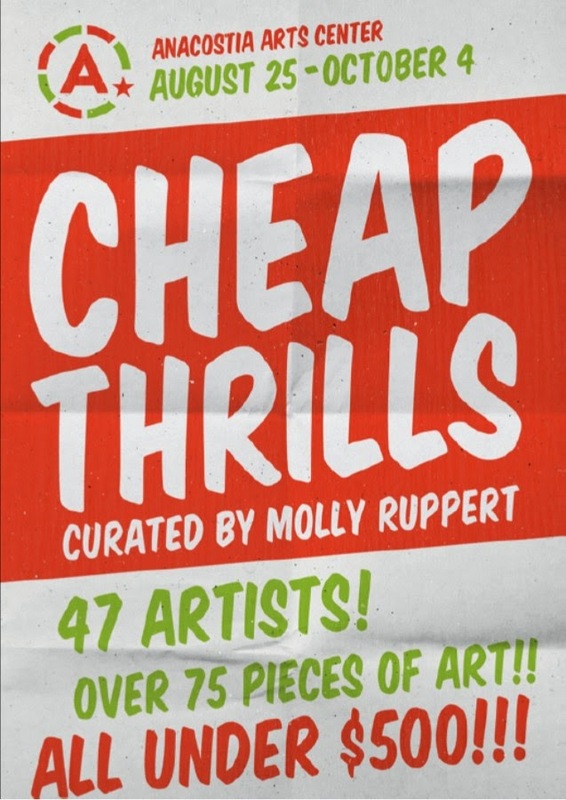 Join Anacostia Arts Center for the opening of Cheap Thrills! Curated byMolly Ruppert, this exhibition will fill the Center with original work. Over 47 artists exhibit varied works all priced at $500 or less! PLUS don't forget to bring your dancing shoes! We will have live performances from DC's own Eastern Standard Time and an electronic soundscape from Ian Dansey. The exhibit is on view through October 4. A night of awesome art, good friends, and live music: PRICELESS!